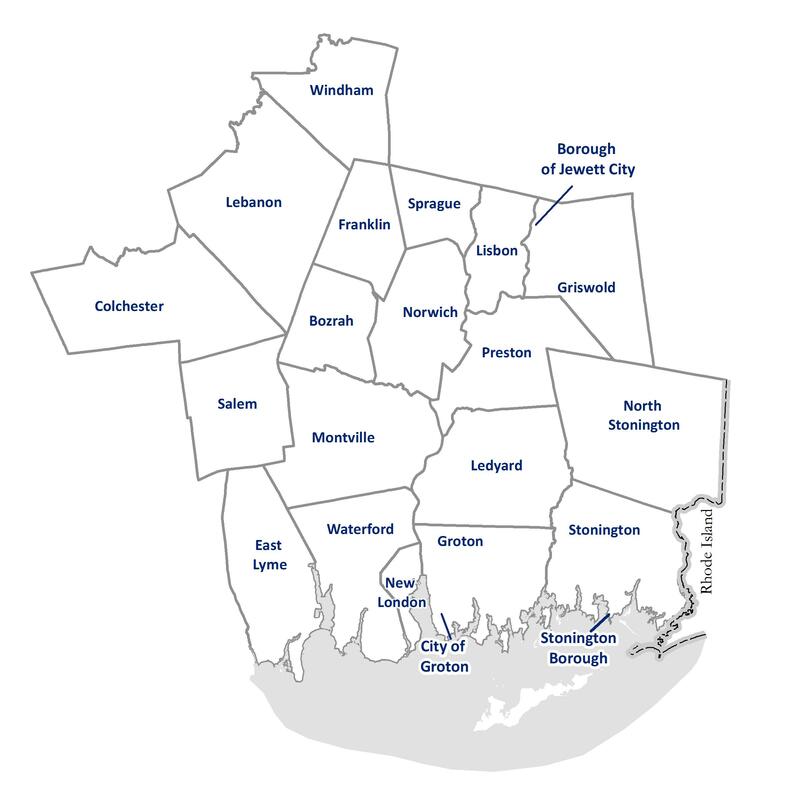 SCCOG – Representing 22 towns, cities, and boroughs in southeastern Connecticut. The Southeastern Connecticut Council of Governments (SCCOG) is a public agency with representatives from twenty-two towns, cities, and boroughs, formed to provide a basis for intergovernmental cooperation in dealing with a wide range of issues. The Council was organized in October of 1992, taking over the mission of the Southeastern Connecticut Regional Planning Agency (SCRPA), which had been in existence since January 1961. Primary focus areas of SCCOG are: Regional Planning, which includes producing studies and plans that affect the responsible development of the region; Transportation Planning and prioritization of State and Federal transportation funding, as the region’s Metropolitan Planning Organization (MPO); and Regional Services, which includes staffing assistance to local land use commissions and exploring additional avenues for cost savings and inter-municipal cooperation. For more information about SCCOG, including membership and committee information, see the About page. For member municipality web links, see the bottom of this page. The Southeastern Connecticut Council of Governments has planned the following events, related to the region’s Bicycle and Pedestrian Plan. Protected facilities, separated from motor vehicles with more than just stripes painted on asphalt, are the new normal for high-quality bikeways. Come see a demonstration of a two-way separated, bicycle facility on Central Avenue in Norwich, April 28 and 29! We want your feedback to help inform the future of bicycle transportation in Southeastern Connecticut, so be sure to check in with one of our volunteers or staff while you’re visiting. Alleys can be dark and scary, but they can also be inviting, fun, lively spaces, when designed properly. May 4th is the day of Griswold’s annual Night Light Parade, and we’ll be preparing through the day, dressing up Fanning Court (the alley between Uncle Kranky’s Cafe and Mandarin Garden) for the occasion with lighting, paint, and more! With a small monetary investment and a healthy injection of volunteer time, smarts, and muscle, almost any underutilized outdoor space can be transformed into an attractive, colorful, and welcoming place. Please come by that afternoon or evening to see what we’ve done! Multi-use path between Gold Star Bridge and the Naval Submarine Base, Groton. Signs for biking and walking can do a lot more than point you in the right direction; a signage system can also provide distance to destination, time to destination, and even “brand” a bikeway or bike/walk network. We are piloting such a system on a route in Groton connecting the US Naval Submarine Base New London and the Gold Star Bridge, between May 11 and 24, and we hope you’ll come to check it out! We want to know what you think of the route, the information on the signs, and the aesthetics of the signs too, so please check in with a volunteer or staffer if you see one set up beside the route. Your feedback will help inform decisions to be made in Groton and across Southeastern Connecticut! SCCOG adopted its 2019-2045 Metropolitan Transportation Plan (MTP) on March 20th. Colchester, Montville, New London, Norwich, and Sprague were awarded grants under the CT DOT Community Connectivity Program. Community Connectivity grants are used for capital projects that improve bicycle and pedestrian safety. Colchester: Town Green Bicycle and Pedestrian Improvement Project, $397,030.00. Montville: Route 32/163 Intersection Improvement, $378,000.00. New London: Connectivity Improvements at Governor Winthrop Boulevard, Water Street, and Ferry Street (signals, sidewalks, crosswalks), $399,901.00. Norwich: Franklin Square Safety Improvements (roundabout), $400,000.00. Sprague: Shetucket River Nature Style Walkway, $400,000.00. The study team is seeking input from constituents with an interest in bicycle and pedestrian transportation to drive planning recommendations.